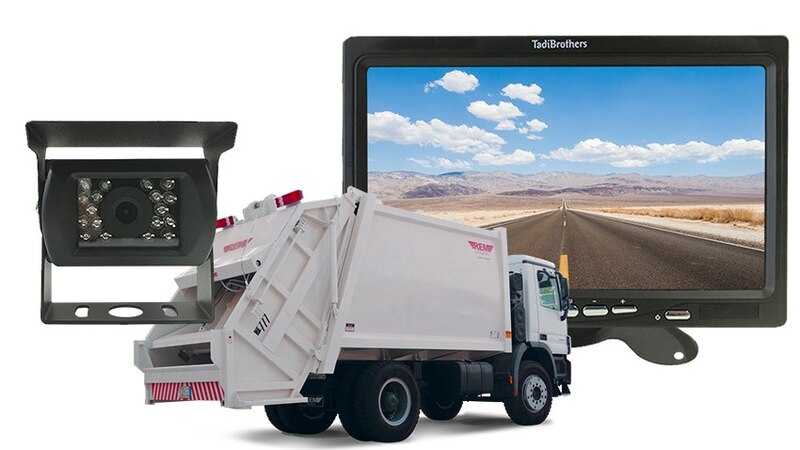 This Garbage Truck Rear View system comes with a 7 inch monitor. This backup monitor has been made for surveillance but with the shock absorption of a garbage truck. This means that you can leave it on 24/7 if needed but no matter how rough the terrain the screen will never flicker or breakdown because of vibration shocks. The monitor is also very thin and comes with a customizable mount that allows you to mount the monitor on your dash or hang it from the ceiling to view in any angle. It’s also encased in a shell that makes it sun proof, we know that these systems get a lot of direct sun during the day and over time that can degrade the quality of the LCD screen but our garbage truck monitors won’t have that problem, they will look as good on 5000 of use as it did on day 5. If you have any question regarding fleet pricing or features do hesitate to call at 866-955-5550 and we will help you in any way we can. The industrial Garbage Truck Box camera Has a 120° Degree viewable angle, its waterproof and has auto night vision. The camera is one of the most durable we have, with incredible adjustability and night vision clarity. The RV Box camera has a metal sun shield visor to protect you from glare and pebbles. This is by far our toughest built camera perfect for the environment that a garbage truck operates in. It has been regularly used in cars, vans, buses and even industrial sized caterpillar trucks, operated in the harsh oil sand of Canada. The CCD lens is the clearest and highest quality camera TadiBrothers sells, also called the HD Backup Camera. This camera can take a direct hit from a rock and it will still work like new, you can mount this anywhere on your garbage truck but most mount it to the middle of the back towards the top of the truck. Keep in mind that this is a single camera system and we know from experience that a lot of municipalities need 3-4 cameras in the system with a mobile DVR, these are all options that you can upgrade to on this page but you can also do this over the phone. Weather you need something more durable, different mounting bracket or just as a mobile DVR we have everything you need. This commercial backup camera system for garbage truck item includes a 75 Foot cable, we have premium extension cables located on the top left of the page if you need one. This rear view system, like most of our vehicular products that have an LCD screen, can be used for video gaming, Considering that a perk or bonus for purchasing our back up system (others block that feature).